Another day another country, time for Norway at long last. When we first talked about this trip it was with the intention to visit Norway, many countries and months later we are finally here. 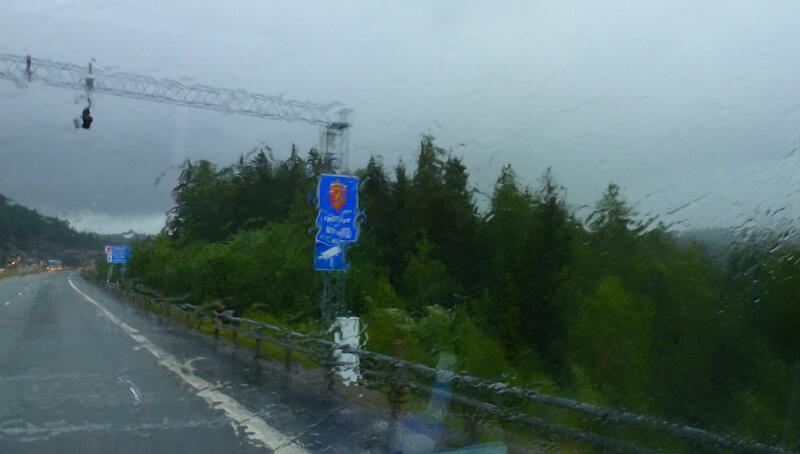 Crossing the border was memorable for more than one reason – the rain was so torrential we could hardly see the Norway sign. Despite our leaving the EC we didn’t pass through Customs, the choice was Red to declare or Green and just keep going, we did the latter and were in with no passports yet again. The question everyone asks us when we arrive in a new country is do we see a big difference. The usual answer is not for the first few hundred miles. However, Sweden to Norway one notable – the elk / moose signs show more than a few family differences within a mile either side of the border. 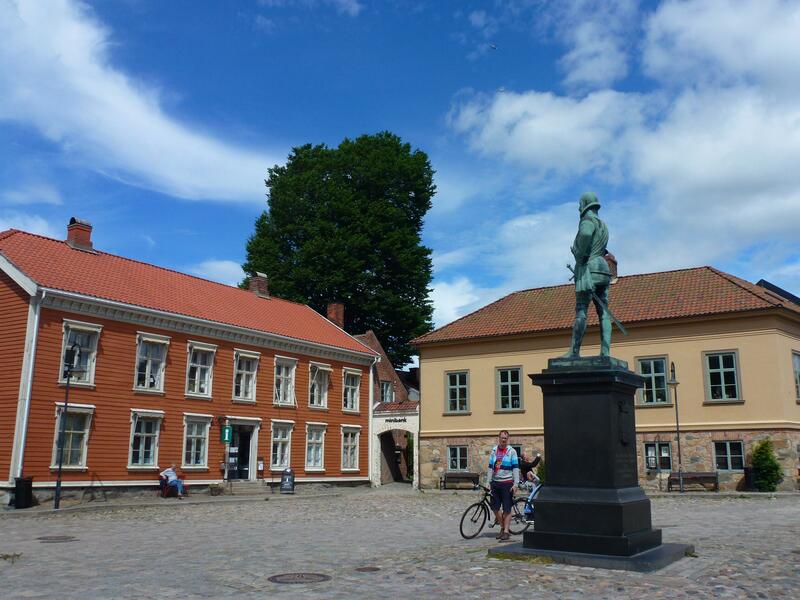 We both agreed we weren’t spending a day driving in rain so pulled into Fredrikstad (birthplace of Amundsen). Possibly not high on the tourist list of must sees, but there was a water bus, offering a free service so rather than look a gift moose in the mouth we took the opportunity of a trip around the city, stopping off at the Old Town with well preserved fortifications dating from the 1660’s. The fort closed in 1905 and was in danger of demolition until after WW11 when it was developed by a handicrafts organisation. Now the many shops concentrate on handmade clothes, second-hand books, artist galleries and craft items. Iain was in school boy heaven finding the largest model rail-road exhibition in Scandinavia is housed there, 2 km of track, 30 train sets, set out over 400 sqm I lost him in there for nearly an hour. That it’s not really a tourist town can be evidenced by the fact we are local celebrities! We had only been parked up an hour when we had a knock at the door from a reporter from the local newspaper asking to do an interview with us :). Apparently, we are the first known visitors from Wales. Interview given, photos taken we are soon to be plagued by the paparazzi as those pioneer Welsh visitors :). Oslo was taken off the visit list as a)we did Copenhagen last week and b) not sure we could afford it. 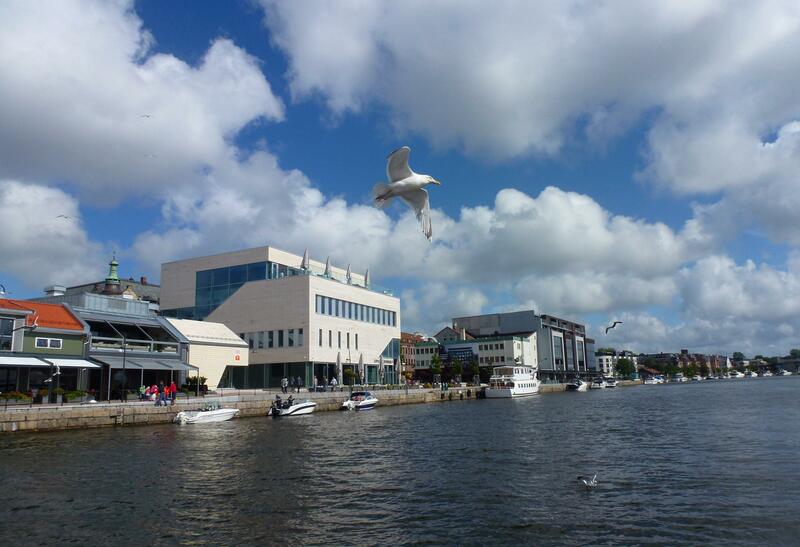 The price of a kebab in Fredrikstad was £13 – didn’t even include chips! Working on the assumptions cities always have mark-up we decided against it and took the Oslofjord Tunnel toll a few miles South of the city. Tunnels aren’t usually that thrilling but credit where it’s due Oslofjord tunnel is amazing. Just over 7 km (4.5 miles) it’s a subsea road tunnel that traverses the fjord. For the first 3.5 km its a steep downhill all the way down to a depth of 134 metres (440 ft) below sea level, then straight uphill for the next 3.5 km. Its been closed several times due to floods, fires and even a landslide – doesn’t instil the greatest of confidence and glad we read all that after we got out the other side. We stopped overnight at Notodden in Telemark county, ‘Seasick Steve’ the Blues musician lives there – according the the local tourist literature he is currently “storming the UK”?? Notodden was our first experience of a Bobil-Camp, a very large piece of waste ground at the edge of the town with a few million Euro worth of monster motor-homes huddled along the fjord, we pitched in on the end and spent the evening watching sea-planes landing a few hundred metres in front of us. 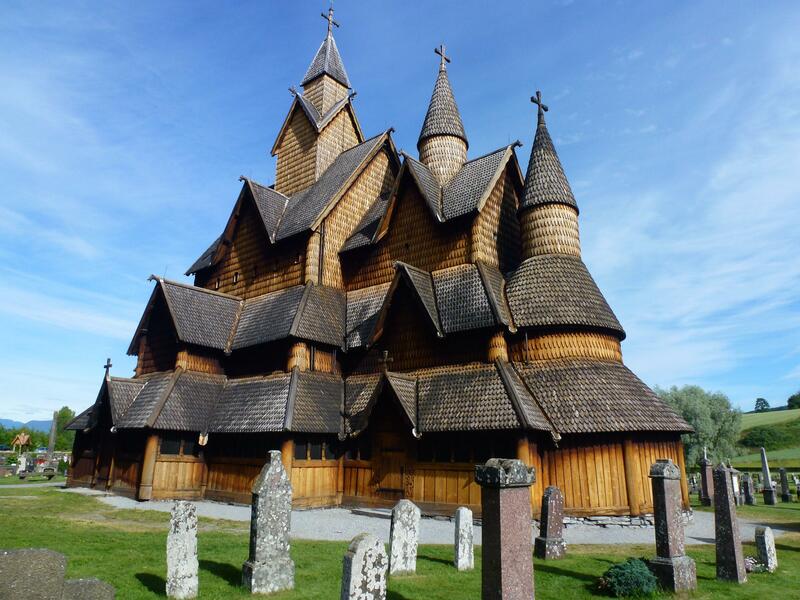 As we left town we came across Heddal Stave Church, 800 years old and the largest of the 28 preserved Middle Age stave churches in Norway. Local legend has it the church was built by a Troll named Finn who disliked church bells, so once the church was built he moved on. Stunningly beautiful, so glad we found it by chance. Our route on the map is now governed by the ‘green line’. We no longer go for shortest or fastest, we just look at the atlas and if there is a ‘green scenic route’ line we take that road. So far so great idea as we drove up the Numedal pass and our first glimpses of some incredible Norwegian scenery. Some of the highest roads we have seen since Scottish jaunts a few years ago, the pinnacle was at Geilo, 1100 metres where we pulled over for the night. We had never heard of it, but it has more claims to stardom than we though possible. First is that the opening episodes of the Empire Strikes Back were filmed there, second claim is that it was the first skiing resort in Norway and and is still one of the largest. The 1980 Para Olympics were held in Geilo and the Queen of Norway gained her ski instructor certificate on the slopes there. If that lot wasn’t enough it’s also famous for having some of the most luxurious and expensive holiday cabins in the country – oh and now those celebrities the Welsh Baxters are staying for a night :).